Marc Marquez (Repsol Honda Team RC213V) contests Honda’s home Grand Prix this weekend with the aim of further increasing his advantage in the battle for the 2017 MotoGP crown. The reigning World Champion, who has won three of the last four MotoGP titles, goes into the Twin Ring Motegi event holding a 16-point advantage over Andrea Dovizioso (Ducati), after winning the last two races, at Misano and Aragon. So far this year Marquez has won five races, with just three rounds remaining after Sunday. He has ridden brilliantly and worked superbly with HRC and his Repsol Honda crew to keep improving the RC213V. Team-mate Dani Pedrosa (Repsol Honda Team RC213V) currently holds fourth place in the championship, after claiming an excellent second-place finish at Aragon. 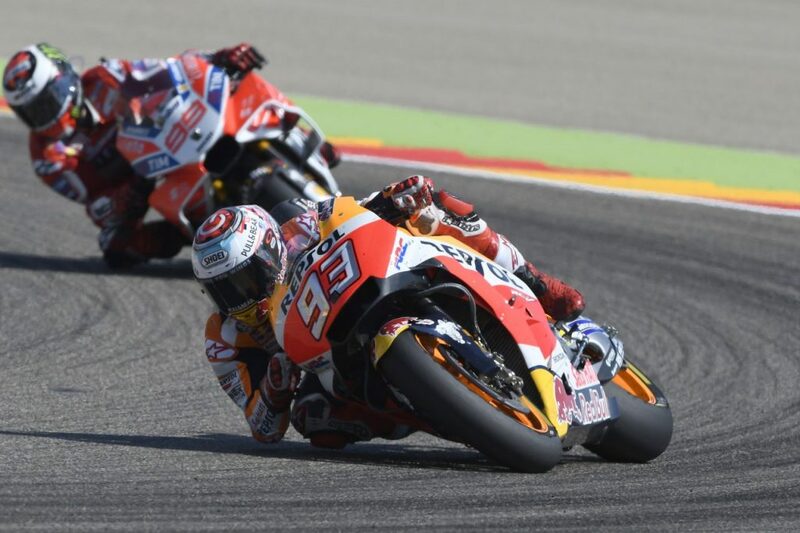 Together the two Spaniards hope to increase Honda’s lead in the Constructors World Championship and the Repsol Honda Team’s advantage in the Teams World Championship to deliver the triple crown. Marquez and Pedrosa arrive at Motegi after visiting Honda Motor Co., Ltd Head Office in Tokyo, where they met fans on Tuesday, along with Japanese Moto2 star Takaaki NAKAGAMI (IDEMITSU Honda Team Asia Kalex). Motegi has good memories for Marquez: last October he wrapped up the 2016 MotoGP title at the Japanese venue, situated in the hills to the north east of Tokyo. At the same time he achieved his first MotoGP victory at the track, bettering his second-place MotoGP finishes in 2013 and 2014, which followed two earlier victories in the smaller classes, in Moto2 in 2012 and 125cc in 2010. The 24-year-old’s latest GP win at Aragon was his 60th across all classes and his 34th in MotoGP, which makes him Honda’s second most successful premier-class rider after Mick Doohan, who dominated much of the 1990s aboard a Repsol Honda NSR500. Thirty-one-year-old Pedrosa has also enjoyed success across all three classes at Motegi, which was constructed to celebrate the 50th anniversary of the Honda Motor Company in 1998. He won the 125cc race at Motegi in 2002, the 250cc race in 2004 and the MotoGP race in 2011, 2012 and 2015. Marquez and Pedrosa have both mastered Motegi despite very contrasting riding styles – whereas Marquez has a more aggressive, spectacular technique, Pedrosa is very smooth and inch-perfect. This is one of the great attractions of motorcycle racing – that different riders can use different ways of riding to the same effect. Cal Crutchlow (LCR Honda RC213V) comes to Japan hoping to be in the battle for another podium finish. Honda’s top independent-team rider has already come close to claiming a top-three finish at Motegi, when he ran out of fuel on the last lap of the 2012 Japanese GP, some years before he joined Honda. Last year Crutchlow finished Motegi in fifth place, the first non-factory rider. This year the 31-year-old Briton should once again have the speed to fight towards the front of the pack. Jack Miller (Estrella Galicia 0,0 Marc VDS Honda RC213V) will miss this weekend’s action after breaking the tibia bone in his right leg in a trials-bike mishap. His place will be taken by former 250 World Champion Hiroshi Aoyama (Estrella Galicia 0,0 Marc VDS Honda RC213V). The 35-year-old from Chiba contested his last full MotoGP season in 2014, riding a Honda RCV1000R, after enjoying a long career in Grand Prix racing. The highlight, of course, was when he won the 2009 250 title, riding a Honda RS250RW. Aoyama won nine 250 GPs, aboard Honda and KTM machinery, including the 2005 and 2006 Japanese GPs at Motegi. Last year Aoyama rode two MotoGP races, taking the place of injured Pedrosa at the Japanese and Malaysian GPs, scoring one point at Motegi, with a 15th-place finish. In 2015 he rode three races for the Repsol Honda Team, while Pedrosa recovered from surgery, scoring an excellent 11th-place result at COTA. Aoyama currently does important testing working with HRC. Miller’s usual team-mate Tito Rabat (Estrella Galicia 0,0 Marc VDS Honda RC213V) scored points last time out at Motegi, finishing last year’s race in 14th place. The former Moto2 World Champion has scored points at nine of this year’s races and has tasted champagne at Motegi, twice finishing in the Moto2 top three. This year’s Moto2 World Championship leader Franco Morbidelli (Estrella Galicia 0,0 Marc VDS Kalex) brings a 21-point advantage to Japan, following another brilliant win at Aragon three weeks ago. A fortnight before that the talented 22-year-old had crashed out of the lead at a soaking-wet Misano, allowing his main title-challenger Thomas Luthi (CarXpert Interwetten Kalex) to close the points gap. Morbidelli has been this year’s star turn in the Honda CBR600-powered series. He took his very Grand Prix victory in Qatar back in March and has scored a further seven wins since then. Meanwhile Luthi has won only once, at August’s Czech GP, but has scored well with his consistency, with only one DNF so far, compared to Morbidelli’s two DNFs. The Italian and Swiss riders are both fast at Motegi. Last year Luthi won the Japanese Moto2 round, while Morbidelli finished third. Whichever of them wins this year’s championship, this will most likely be their last chance, because they both graduate to MotoGP in 2018, riding Honda RC213V machines for the Belgian-based Marc VDS squad. Morbidelli and Luthi are so far ahead of the rest of the pack that their title battle is a two-way affair, leaving Alex Marquez (Estrella Galicia 0,0 Marc VDS Kalex) and Miguel Oliveira (Red Bull KTM Ajo KTM) duelling for third overall. Marquez, younger brother of Marc, had been in the Moto2 title fight until a couple of crashes cost him too many points. He was injured during Misano practice, which forced him to miss that race. He bravely returned for the subsequent race at Aragon but had to withdraw while riding with the front-runners, due to the effects of the injury. Those two no-scores allowed Oliveira to move into third overall. The Portuguese and Spaniard come to Motegi separated by two points. Star rookie Francesco Bagnaia (Sky Racing Team VR46 Kalex) holds fifth overall, with three podiums so far. Next is Mattia Pasini (Italtrans Racing Team Kalex), winner of June’s Italian Moto race and scorer of four pole positions. The Italian veteran is just seven points ahead of Nakagami, who won his first race of the year at Silverstone and will be doing everything in his power to win again in front of his home crowd at Motegi. This is the 25-year-old’s last chance to win his home Moto2 race before he graduates to MotoGP next year, joining Crutchlow at LCR Honda. The Moto2 top ten is completed by Simone Corsi (Speed Up Speed Up), Misano winner Dominique Aegerter (Kiefer Racing Suter) and reigning Moto3 World Champion Brad Binder (Red Bull KTM Ajo KTM). Binder won’t be reigning Moto3 king for much longer. The amazing Joan Mir (Leopard Racing Honda NSF250RW) brings an astonishing 80-point championship lead to Motegi. All the 20-year-old Spaniard needs to do to claim the 2017 Moto3 World Champion is finish Sunday’s Moto3 race with a 75-point lead. This year no other rider across all three classes has dominated like Mir, and this despite the fact that Moto3 regularly delivers the closest racing in MotoGP, with the difference between winning and losing often no more than a few hundredths of a second. Mir isn’t the only outstanding performer in Moto3. Honda NSF250RW’s has utterly dominated the 2017 championship, winning all bar one of the 14 races so far and currently filling the top six positions in the points standings. Mir’s closest rival is COTA and Misano winner Romano Fenati (Marinelli Rivacold Snipers Honda NSF250RW), who has 191 points, compared to Mir’s 271. Fenati isn’t entirely safe in his quest for the runner-up spot. The 21-year-old Italian has 17-year-old Aron Canet (Estrella Galicia 0,0 Honda NSF250RW) just 18 points behind. Canet won his first Grand Prix at Jerez in May and has climbed to the top step of the podium twice since, at Assen and Silverstone. Canet is well clear of Fabio Di Giannantonio (Del Conca Gresini Racing Moto3 Honda NSF250RW) and Jorge Martin (Del Conca Gresini Racing Moto3 Honda NSF250RW), who are just three points apart in their battle for fourth overall. Both riders have been podium regulars this year, although Martin missed two midseason races through injury. The final rider in Honda’s mighty half dozen is John McPhee (British Talent Team Honda NSF250RW), who has finished on the podium at three races this year. The Briton holds a single-point advantage over seventh-placed Marcos Ramirez (KTM). Enea Bastianini (Estrella Galicia 0,0 Honda NSF250RW) had a difficult start to 2017 but has recently turned a corner to take two podium finishes from the last three races. This weekend Bastianini believes he can take the next step to victory, because he scored his last Moto3 win at Motegi last October. Moto3’s top Japanese rider of 2017 is Tatsuki Suzuki (SIC58 Squadra Corse Honda NSF250RW) who has scored five top-ten results this year, with a best of three eighth-place finishes in Argentina, the Netherlands and the Czech Republic. The 19-year-old from Chiba is placed 15th overall, with rookie Ayumu Sasaki (SIC Racing Team Honda NSF250RW) in 21st. The 16-year-old from Yokosuka is enjoying a promising first year in GPs, with five points-scoring finishes so far, including a best of eighth place at the Italian GP, where he finished just seven tenths of a second behind the winner! Japan has hosted a round of the motorcycling World Championships on and off since 1963, when the Japanese GP was held at the brand-new Suzuka circuit, the country’s first roadrace venue. Honda founder Soichiro Honda built Suzuka to give his countrymen the chance to compete on a real racetrack, helping to improve Japanese riders and Japanese machinery, and to bring GP racing to Japan. Motegi staged its first World Championship race in 1999. The track is a great test for riders and machines, with braking stability and acceleration performance especially important. MotoGP’s Asia-Pacific adventure continues next weekend in Australia and the following weekend in Malaysia. The season concludes at Valencia, Spain, on November 12.